Reading and share top 24 famous quotes and sayings about Things Go Wrong by famous authors and people. 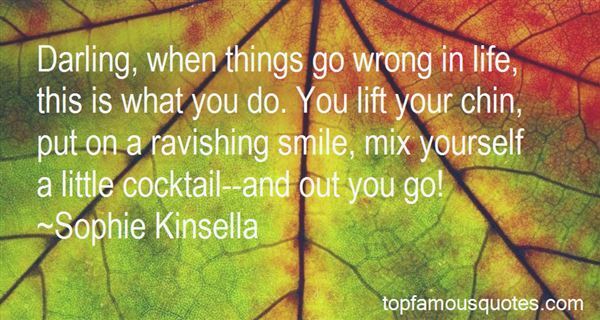 Browse top 24 famous quotes and sayings about Things Go Wrong by most favorite authors. 1. "Theres a process of self doubt when things go wrong. Whether or not its personal or a friend in trouble, looking at ones self isn't always the answer neither is seeking god. Just acception and the will to decide is a human condition, but the circle of choices flux with time. So fight my friend or choose your demise, because after all we are only human." 2. "The part when they are together for a while, the two of them, before things go wrong. The way things ended always obliterated the genuine happiness that had come before and that shouldn't be the case." 3. "Looking back now, I would say that this was one of the first valuable lessons I learned, and one that would be useful in my future line of work. Sometimes things go wrong. It is inevitable. But it is a mistake to waste time and energy worrying about events that you cannot influence. Once they have happened, let them go." 4. "A lot of what I've been learning in the last two years is due to therapy - about my sexuality, why things go wrong, why relationships haven't worked. It isn't anything to do with anybody else; it's to do with me." 5. "Oh, and one thing. Please, please don't depend on me too much. I mean that. I'm not going to be of much help. If your plots come to a head—if things go wrong at the last moment and you're in danger or distress—don't think of me. I will fail you. That I promise from my heart with absolute sincerity." - Lightsong"
6. "You have to take the good with the bad, smile with the sad. love what you got, and remember what you had. Always forgive, but never forget, learn from your mistakes but never regret. People change, things go wrong, but just remember life goes on." 7. "If things go wrong, I'll lead them away. Once it's clear, get back to the car. If you don't see me in five minutes, then I've probably died a very brave and heroic death. Oh and don't Oh, and don't touch the radio--I've got it tuned right where I want it and I don't want you messing that up." 8. "When things go wrong, don't go with them." 9. "Alas, how easily things go wrong!A sigh too much, a kiss too longAnd there follows a mist and a weeping rainAnd life is never the same again"
10. "The man upstairs can take it when we are mad. Swear all you want he can handle it. But do not remember God or whatever almighty force you believe in just when things go wrong. I am sure he would want to know it too when you are happy. The same goes for your friends. Don't dump on them just bad stuff but also share your happiness with them too." 12. "In America access is always about architecture and never about human beings. Among Israelis and Palestinians, access was rarely about anything but people. While in the U.S. a wheelchair stands out as an explicitly separate experience from the mainstream, in the Israel and Arab worlds it is just another thing that can go wrong in a place where things go wrong all the time." 13. "I will have nothing to do with a God who cares only occasionally. I need a God who is with us always, everywhere, in the deepest depths as well as the highest heights. It is when things go wrong, when good things do not happen, when our prayers seem to have been lost, that God is most present. We do not need the sheltering wings when things go smoothly. We are closest to God in the darkness, stumbling along blindly." 14. 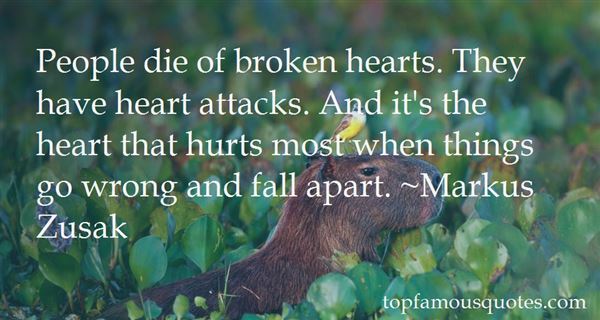 "People die of broken hearts. They have heart attacks. And it's the heart that hurts most when things go wrong and fall apart." 15. "All the mega corporations on the planet make their obscene profits off the labor and suffering of others, with complete disregard for the effects on the workers, environment, and future generations. As with the banking sector, they play games with the lives of millions, hysterically reject any kind of government intervention when the profits are rolling in, but are quick to pass the bill for the cleanup and the far-reaching consequences of these avoidable tragedies to the public when things go wrong. We have a straightforward proposal: if they want public money, we want public control. It's that simple." 16. "I refuse to give up when things go wrong because there is always a sliver lining behind the cloud." 17. "No one is a greater schoolgirl in spirit than a cynic. Cynics cannot relinquish the rubbish they were taught as children: they hold tight to the belief that the world has meaning and, when things go wrong for them, they consequently adopt the inverse attitude. "Life's a whore, I don't believe in anything anymore and I'll wallow in that idea until it makes me sick" is the very credo of the innocent who hasn't been able to get his way." 18. "In a way, it's nice to know that there are Greek gods out there, because you have somebody to blame when things go wrong. For instance, when you're walking away from a bus that's just been attacked by monster hags and blown up by lightning, and it's raining on top of everything else, most people might think that's just really bad luck; when you're a half-blood, you understand that some devine force is really trying to mess up your day." 19. "The man who smiles when things go wrong has thought of someone to blame it on." 20. 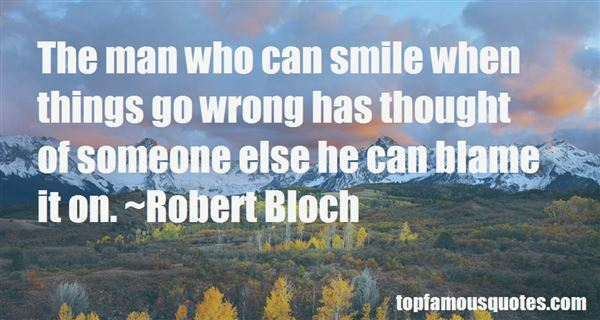 "The man who can smile when things go wrong has thought of someone else he can blame it on." 21. "If one man is representing India in cricket, then yes, blame that person when things go wrong." 22. "Enduring technological optimism, a belief that as other things go wrong, science will go right." 23. "Darling, when things go wrong in life, this is what you do. You lift your chin, put on a ravishing smile, mix yourself a little cocktail--and out you go!" 24. "When things go right it's hard to figure out why, but when things go wrong it's really easy." But the thing is, most of the time bad things don't happen. Rocks don't fall. Earthquakes don't occur. New vents don't suddenly open up. For all the instability, it's mostly remarkably and amazingly tranquil."